her personal art collection, the museum was first opened to the public in 1852, making it one of the oldest and most prestigious museums in the world. Art-lovers have been anxious to find out what the museum prepared for them on its grand jubilee. Remarkable exhibitions and major cultural events will be worth the long wait, Russian President Vladimir Putin says. "The Hermitage is undoubtedly a unique museum. With more than 3 million pieces of art, its collection is literally the common property of humankind. 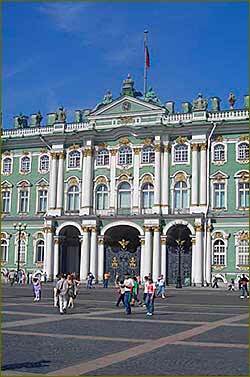 The Hermitage is the pride of Russia and of course we are doing everything to celebrate its anniversary adequately. There is a whole series of spectacular events planned to commemorate this date,"Vladimir Putin said. The organizers have been busy planning for this monumental event. A new wing of the museum opened to the public in the General Staff Building directly across from the Winter Palace. This new wing consists of five courtyards and 800 rooms all dedicated to art from the 19th to 21st centuries. The opening of this behemoth new wing makes the Hermitage the largest museum in the world. By 2014 the church inside of the Winter Palace was restored and all of the museum’s permanent displays in this area have been renovated. Electronic catalogues of the museum’s collection and a new website are also under way. Mikhail Piotrovsky, the Director of the Hermitage, particularly pitched museum's role in the modern-day world after all the jubilee innovations. “We live in a false virtual world, which is rife with the aura-strapped Internet images. This is not the case with the Hermitage Museum, where each and every work of art bears its own aura - something that I can enjoy indefinitely,”Mikhail Piotrovsky said. The exhibitions of Edgar Degas, Antonello da Messina and masterpieces of the 20th century from the Albertina Gallery of Vienna are just a few of the major exhibitions that mark the jubilee year in the Hermitage. 2014 is also the year of the 20th anniversary of Manifesta, the European Biennial of Contemporary Art, which was initiated in response to the new social, cultural and political reality that emerged in the aftermath of the Cold War. The renovated General Staff Building, the new premises of the State Hermitage Museum dedicated to modern and contemporary art, which is now fully open, will be the main stage of Manifesta 10. Thus, the 250th anniversary of the Hermitage is to become a large-scale international cultural event. Culture news archive for 10 January' 2014. Culture news archive for January' 2014. Culture news archive for 2014 year.